The Brooklyn Navy Yard is usually off-limits to the public, but for one day this weekend, more than 40 artists, designers and workshops are opening their doors as part of Open House New York, including me. 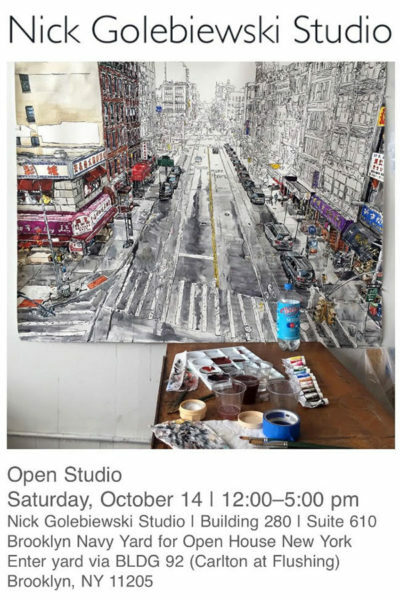 You’re welcome to visit my Brooklyn Navy Yard studio on Saturday, October 14 from 12 to 5 pm to see current gouache paintings in progress, photo prints from the “Nick’s Lunchbox Service” daily-drawing series, and finished pieces from my archive. Open House New York is free and no advanced registration is required. The Navy Yard’s BLDG 92 is the entry point for the event, which includes many other participants. BLDG 92 is located at the intersection of Carlton and Flushing Avenues at 63 Flushing Avenue in Brooklyn, NY. I’m in Building 280 on the sixth floor, just a short walk to the west from the starting point. A shuttle bus will be running throughout the day between locations.